At the end of March, David's parents came out of to visit and decided to bring the next oldest grandchild with them so the girls could all play. 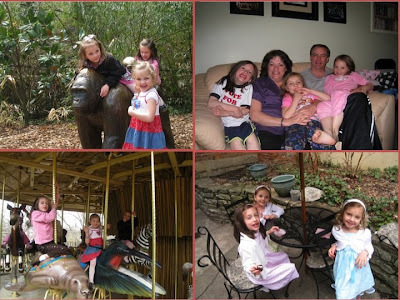 We had a great time going to the Zoo, having a dress-up tea party at a local bakery and mostly just hanging out. Grandma and Grandpa also taught my girls how to play card game 'spoons.' My kids thought it was hilarious. Of course that is partly b/c they put their own twist to it and every time someone lost they got a letter, the first one to spell the word D-O-N-K-E-Y had to act like one at the end. Very funny. Eva joined in on Jeana's dance class while they were here. They both had a lot of fun and Eva was totally overly enthusiastic. In fact, I wouldn't be surprised if she left the one hour lesson with a few injuries. For Family Home Evening this week, and since March was almost over, we decided to head to local and oh so popular Home Depot. The kids helped me pick out seeds and we bought a little start kit for both of them to grow their plants in. They were mostly excited about the lettuce because it was called, 'Black-Seeded Simpson.' We also planted cucumbers, sunflowers, tomatoes and corn. And the highlight...getting to meet cute baby Emmett for the first time. When my parents and Chris and Kristal and the girls drove out, we met them in Nauvoo. I knew it was going to be a fast trip and that Dave couldn't get work off, so initially I wasn't up for the extra drive. However, Nathan and Melinda convinced me to come and let us tag along in their car, so the drive wasn't as bad. It also gave us a few more days to hang out because Dave's parents were coming at the end of the week, so we had to take off before everyone else. Here is Jeana posing in front of the temple. A very pretty girl in front of a very pretty temple. Here is Jeana sitting in the window at Carthage Jail. She was listening to the speaker talk about what had happened and after hearing that this was the window Joseph Smith fell through, I think it was a little touching for her and she was pondering the idea. Here is Jeana down on the Outside grounds of Carthage Jail. Nathan and Melinda and Family in front of the Nauvoo Temple. Chris and Kristal and their family...same spot. The girls and me...again same place, same time. Every once in a while, I like to pretend that I have photography skills, I snap a few pictures, then I get over it. Grandma and Grandpa and grandkids riding on a horse drawn wagon. Ethan got to be a bigger helper. Again that itch for photography snapping comes out. Again drawing water from a well. Abby fell in love with baby Rylee. She seems to find the babies wherever we go. Very fun. The groupies. 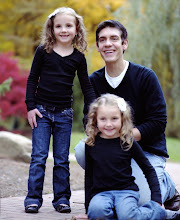 The kids and I hung out, since I was husbandless for a while so the other adults could go to the temple. Last week I was hurrying to get ready and Abby had the day off of school and decided she wanted to be a big helper. So, she wanted to 'secretly' make all of our beds. It was quite thoughtful and a pretty good attempt on her part! Step 1: Smile with tooth still in place. Step 2: Copy her other girlie friends and have Dad attach tooth to string, then door and slam shut. 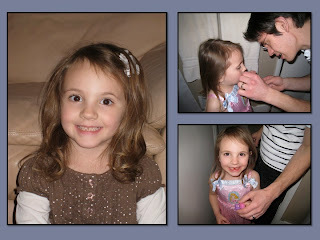 Step 3: Let Mom take over b/c Dad can't seem to tie a tight enough knot around the tooth. (Where are those future surgeon skills anyway?) Step 4: Close Door. Step 5: Repeat. Hey, if you're already pulling one out, you might as well make it two! After all, isn't the whole goal is to collect as much money as possible from the Tooth Fairy anyway? It is hard to know where all the time goes. I cannot believe my baby is 5--it happens all too soon. This year for her Birthday, we decided to do a bowling party. She has another little friend that she plays with a lot, who was also in her preschool class and since they share most of the same friends and their birthdays were only a few weeks apart, we decided to combine efforts and throw a party for both of them. 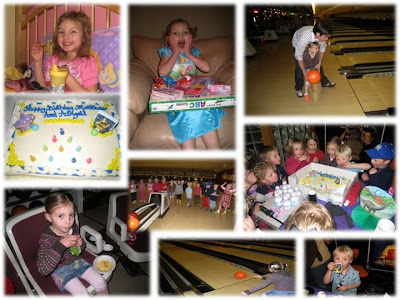 I wasn't feeling super creative, nor did I feel like hosting that many 5 year olds, so we planned a bowling party (Bowling + Costco Cake= low stress party for Mom-yeah!) They all had a great time. The most exciting part of course, was they all got a medal at the end. On the day of her birthday, we asked what she wanted the biggest request was breakfast in bed--another tradition started by some good friends here. Anyhow, she of course woke up early that morning and wouldn't get out of bed, she was just waiting for us to serve her. Jeana had fun helping too. I would have to say that was probably the highlight of her day--though the presents were fun too.